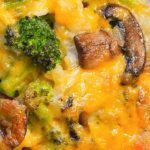 Broccoli Cheese Rice Casserole - What's In The Pan? Broccoli Cheese Rice Casserole is the casserole that I made to serve with Roasted Spatchcock Chicken and Potatoes Au Gratin. Since then, it became a staple in our family. And now we all look forward to it so much on weekends and holidays! 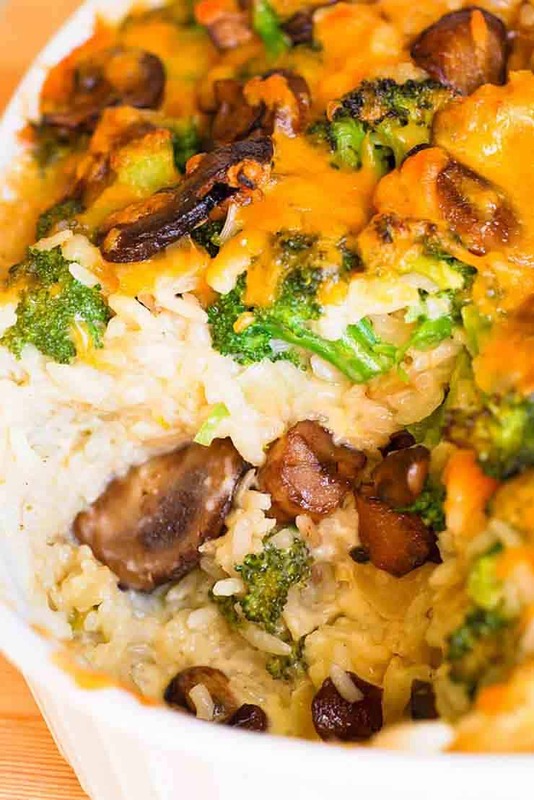 Just mix cooked rice, mushrooms and broccoli into the luxuriously creamy sauce. So delicious with Roasted Turkey Breast! 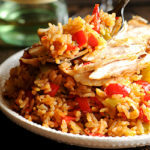 You can simply reheat it for an easy lunch! I also love to change it up a bit. Sometimes I add in broccolini instead of broccoli. I also like to use asparagus here. 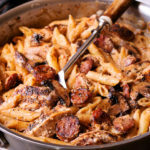 This casserole will last for a good 5 days in the refrigerator. First you will need a medium saucepan to boil broccoli. You will also use a medium skillet to cook onions and soften mushrooms. Finally, you will bake it in the medium casserole dish. 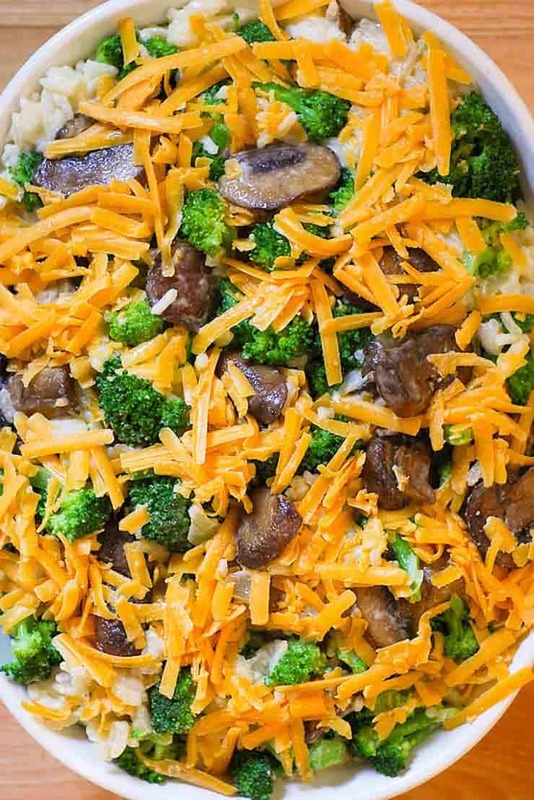 First things first for this Broccoli Cheese Rice Casserole is cooking your broccoli. Place broccoli in boiling water for about 2 minutes. Then take it out. You still want it slightly crisp as it cooks more in the oven. Next, you will cook onions, garlic and mushrooms on medium-low heat. I love to use maple shiitake mushrooms, but feel free to use any type of mushrooms you like best. Once your mushrooms are ready to go, simply add heavy cream and chicken stock to the same skillet. Then, I go ahead and add in garlic powder, salt and pepper. You can also add onion powder at this point as well. Add in some shredded cheese to your casserole, and mix it in well. I always use freshly grated sharp cheddar for this casserole. But some of you like more cheese in your Broccoli Cheese Rice Casserole, so feel free to add some shredded to this if you’d like. When I add more cheese I stick to about 2 cups for best results. Finally we will sprinkle some cheese on top! I recommend to refrigerate it for up to 3 days. 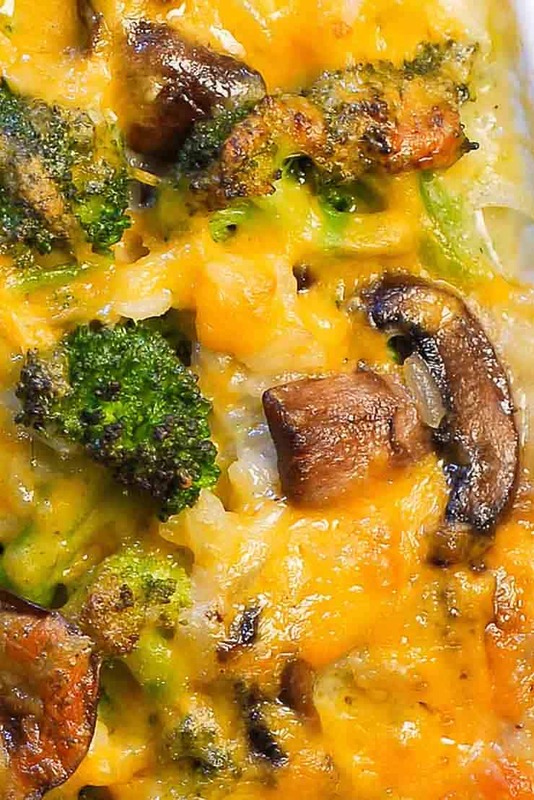 But you can definitely freeze this cheese broccoli casserole as well. So feel free to make it in advance of the holidays! Bright and vibrant with lots of shiitake mushrooms. Preheat oven to 350F and start heating the water in a medium saucepan for the broccoli. Add the broccoli to the medium saucepan with water. Cook for only 2-3 minutes. Drain and set aside. Preheat large skillet at medium high heat. Add olive oil. Add chopped onions, garlic and mushrooms and cook them for 4-5 minutes until softened. Next add heavy cream, chicken stock, 1 cup cheese, salt, garlic powder and black pepper to the skillet. Bring the mixture to a simmering point allowing the sauce to thicken a bit, just about 2 minutes. Add cooked rice and broccoli to the skillet with the sauce and mix well. Transfer the mixture from the skillet onto a baking casserole. Sprinkle with the remaining cheddar cheese on top. Bake for 20 minutes. You can freeze it uncooked, but without heavy cream. Because when mixed in with other liquids, it will become diluted in its fat content and might disintegrate when defrosted. Add it into the casserole immediately before it goes into the oven. I accidentally bought salted chicken stock will that be too salty? It should be fine – I specified sodium free chicken stock in order to avoid anyone overloading on their salt intake, since I also have 1 teaspoon of salt in it. It also depends how salty your chicken stock is. You can always adjust by adding less salt to the recipe. Judging by your photo, those are not Shiitake mushrooms! 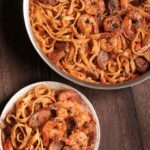 Is it a big deal if using regular milk instead of heavy cream? 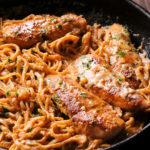 I would stick to heavy cream, otherwise it might turn out too watery.